You are here: Home » News & Events » Will the digital workplace evolve like the intranet did? I hope not. Will the digital workplace evolve like the intranet did? I hope not. 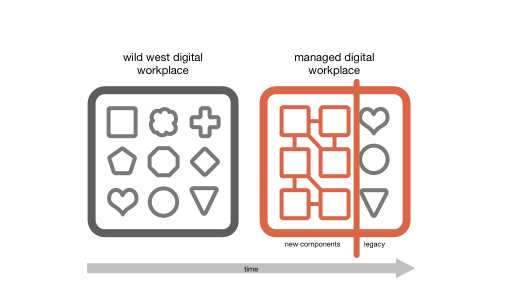 Synopsis: The evolution of digital workplaces looks similar to that of intranets before them. It’s critical to recognize the patterns, master the success factors and know where the similarities end. The digital workplace, from an organization’s point of view, is all the digital tools and services provided to employees to help them do their jobs. It’s not a metaphor, it’s a name – a collective noun. Each of those services runs on a server inside or outside of the organization. Each one of those services has someone inside the organization who wants it, or at least begrudgingly signs off the budget. All technology is eventually physical. Firstly the concept of “intranet” is constraining as it means “our stuff in a web browser”. Social and collaboration tools are straining at the buttons of that concept like a middle-aged man in his wedding suit. Real-time tools such as Microsoft Lync are part of a continuum of collaborative tools that flit from web browser to desktop clients and to mobile apps. For some organizations (but not all), fencing off collaboration in the browser strategically and organizationally is plainly ridiculous. Looking at the whole suite of provided tools, and the market of unprovided competitor tools, just makes sense. Secondly by acknowledging the fact that digital working has changed our working habits we can start to make more effective suites of tools to support the current reality. Instead of assuming that people working outside of the office are bizarre and rare exceptions, we can begin to think of enterprise mobility as a normal 21st century work pattern. Instead of assuming that people work with their line manager and team in the same office everyday we can begin to recognize the reality of working in a digital swirl with leaders, team members, project teams, people on the other side of the world, customers, suppliers and consultants. Giving that collection of tools a name, “the digital workplace”, is part of normalizing that unrecognized reality of change. Giving that collection of tools a name, “the digital workplace”, is part of normalizing that unrecognized reality of change. As I’ve already mentioned, the intranet remains special. It is able to provide structure and, if done well, can be a cultural focal point for branding and values. Content management and publishing remains a massive problem, but employees still need to be able to find essential information in a hurry, and complete their expenses. Not. Dead. Yet. There was once a time of unopposed explosion of content where every team had a server under their desk, each with a site with a different brand. There were animated GIFs, sections under construction and a picture of the boss saying “Welcome to our intranet site”. There were transactional applications that were only available in the afternoon because they were running on some American guy’s laptop (true story). The main thrust is that there was a sprawl of start pages, applications and content that was organized in a way that did not make sense to people. The craft of intranet management was to oppose the twin forces of mediocrity and entropy. The craft of intranet management was to oppose the twin forces of mediocrity and entropy. Collaboration platforms are everybody’s angels at the moment and their use is exploding in many organizations. They too need to address issues of findability and control before they get adopted to death. Cycles of IT investment: Enterprise IT works in cycles of investment around various strategic platforms. This comes in waves and includes the “we buy what Redmond sells us” Microsoft Stack. Specific, targeted tools: The more business-specific tools that might be bought in from a third party or created internally. Historically in many organizations IT was created at a regional or national level, as it was commissioned. It is still fairly common to have separate HR systems for each location. Enterprise architecture must yield to the realities of mergers and acquisitions. Ghosts of the acquired live on as the shadows of systems long after their rebranding. This is vernacular architecture at best, rather than the finest grand avenues of urban architecture. Wires criss-cross the sky and it all just about hangs together. So are there parallels between how the digital workplace will evolve and how the intranet did? Intranets exploded in the late nineties and many of the techniques of intranet management were developed to create control of a deeply ambiguous space. They are appropriate for the worst-case scenario train crash that is the multiple stakeholders with different objectives (I like the term “goat rodeo”). The digital workplace is more functional than content-based and I instinctively believe that much of it is more simple. But it is huge and expensive, and massive high-stakes projects aren’t easily influenced. If the intranet is a dainty yacht the digital workplace is a supertanker by comparison. So we stand here with a choice to make – “do” or “do not”. Thanks Yoda. Digital workplace as a market? We could rid ourselves of all this work to try and make things tidy. Maybe it is just an overhead? We could regard the digital workplace as a market. Good stuff will be used, and bad stuff will die. People will self-organize. We can delegate structure and coherence for users to find their own way to complete a task – what’s the use of a homepage when you’ve got a home screen? This sounds cold to me, and I don’t see how it helps Doris in accounts find the bereavement policy or Jeff in collections fill in the right form. It seems to be a bit biased in favour of those who are technologically skilled and networked. It is the laissez-unfair position. Most organizations have decided to manage the chaos of the intranet and provide tools and content in a way that makes sense to users. Not many organizations have tried to be so comprehensive in their finessing of the wider digital workplace. Given the substantial legacy that most large organizations bring with them, that might not happen retrospectively, but we can hope that new services will be brought to their users with a bit of thought. Stay reactive to the opportunities to support new ways of working and different behaviours. Some of the lessons of good intranets can be used order to shorten the evolution of digital workplaces, but not all, and we can skip a few painful phases of development. Jump past the chaos but reject the impossible vision of perfection. Borrow ideas but don’t assume intranet and digital workplace development will be the same. This will contribute to better, more functional organizations with the tools they need to get the job done. Let’s avoid the wild west.